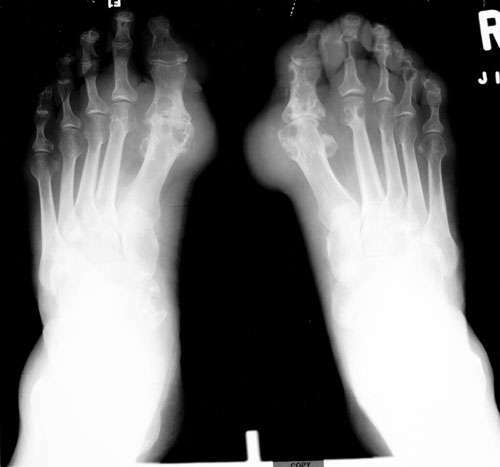 Dorsoplantar views of both feet show an asymmetric arthritis involving the great toes predominantly as well as other joints. This arthritis is characterized by well marginated erosions, a large area of soft tissue swelling related to tophus, with relative preservation of the joint space given the amount of periarticular erosion present. The findings are typical of gout, which spares the joint space itself until late in the disease. The erosions with their overhanging edges have been called “Mickey Mouse ears” or “cookie cutter” type erosions.